The word automation has soaked up a soiled reputation lately. While it brings the promise of efficiency and time-savings, there are deeper fears associated with the word that we can’t seem to shake. Anxiety builds around the idea that robots will take over our jobs and there’s a resonating sentiment that we’ll lose our humanity by relying heavily on automation! While there may be elements of truth to this, (check out the Burger-Flipping Robot that threatens to replace fast-food workers) companies who embrace automation in customer service often find that handing off the more repetitive support tasks to automation frees up time to provide better and more personalized customer service. Automation isn’t trying to replace human touch points, but it should be used to qualify, highlight, or progress someone to the right points where human touch is essential. The question becomes, what is the right balance? 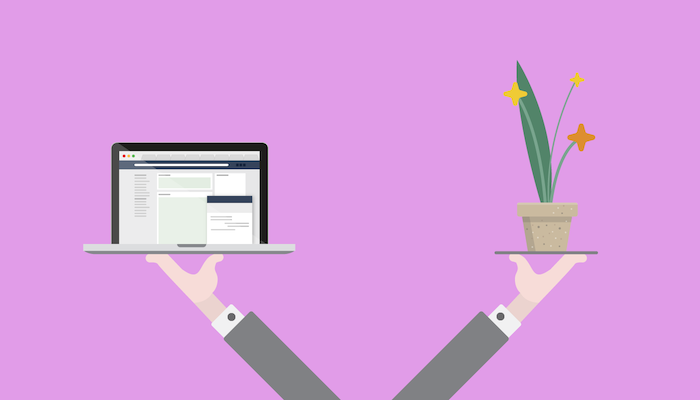 How can you implement support automation without losing that personal touch? Here are a few examples of ways that you can exploit the strength of automation while significantly improving the customer experience. We’ve all been there! Clicking a link and hitting a 404-error. Confused about a company’s features or messaging. Receiving an error that leaves you lost and frustrated! Whether we like it or not, customers encounter issues that are often out of our control. What we can control is the way in which we resolve these problems. According to eConsultancy, 94% of customers proactively invited to chat were somewhat or very satisfied with their live chat experience! The lesson here? Don’t wait, initiate! If you’re tracking activity on your website or within your product, you can leverage this information to reach out to customers when they experience an issue proactively. For example, let’s say you receive three support tickets from users describing slow load times on your site. If you’re not able to immediately resolve this with your engineering team, let customers know! 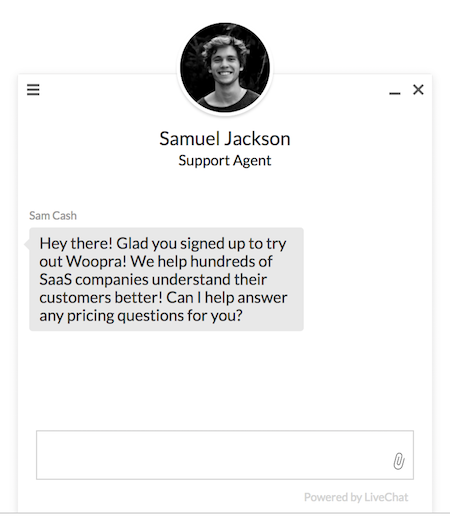 Trigger a live chat message to visitors with a greeting that explains the issue and assures them that you’re working to fix it. Repeatedly viewing specific documentation pages could mean that a customer or prospect has been unable to get the answers they need. To assist, proactively reach out when a customer views the same documentation pages several times. For example, let’s say a user is browsing your user guides and has clicked an article about eCommerce implementation five times. The fact that they’ve come back to view a specific page multiple times is a strong indicator that they need assistance. These behaviors provide an excellent opportunity to trigger a chat message or email. Make it relevant by including links to additional documentation on the same topic they were researching! As they say, the best offense is a good defense. Instead of passively waiting for complaints or questions to arrive, leverage the data at your disposal. Identify the different moments that indicate a visitor or customer could use help. Then, create personalized messaging around those moments to automatically send when a user takes a specified set of actions. If Batman and Robin were a customer support team, consider yourself Batman and the role of your sidekick, starring Automation. You could both work separately, but together, you’re a powerful ticket fighting duo! If you sift through support inquiries, I’m betting you’ll find a series of similar questions posed at similar moments in the customer experience. Many of these questions tend to arise in the research and purchasing phase of the buyer’s journey. In fact, a global survey found that 83% of customers need live support for assistance while making a purchase! While it’s important to nurture users from their first website visit onward, the purchasing phase is your opportunity to turn visitors into lifelong customers. Odds are, you don’t have the resources to provide an instant response to every inquiry. But, you can still provide personalized service by leveraging some automation. What’s the difference between your package options? Prepare these questions and answers in a referenceable, linkable, document. You should also place them in the resources section on your website or within your documentation. Next, identify the behaviors that segments of visitors take before they ask one of these common questions. We complement this behavioral data with additional user information such as demographics and corporate fit data. 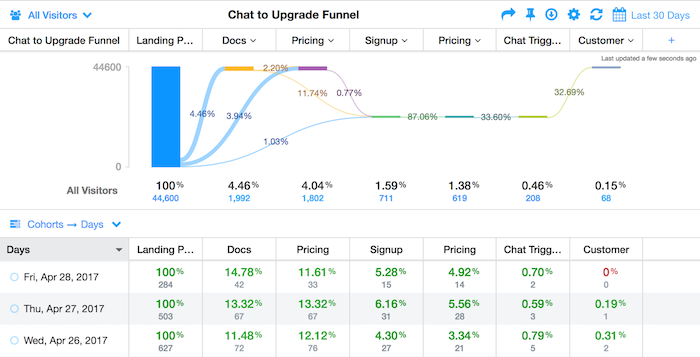 If a user takes the actions that we’ve defined as “engaged in the pricing phase” and appears to be a good fit, we can automatically trigger an email or live chat message. Because we know who this user is and their behavior, the message includes the most relevant questions and answers, based on their persona. An eCommerce company could set up similar automation. Targeted messaging could be pushed based on the product categories a user has viewed, items added to cart, abandoned items, descriptions read, and so on! The more data you collect about your visitors and their browsing behavior, the more you can personalize and engage in the moments that matter most. You could also leverage behavioral data to provide personalized support to customers while they’re researching a purchase. For example, a user visiting your pricing page for more than five minutes is probably interested in learning more, but might have questions. Trigger a chat window based on pageview session duration. The greeting could offer guidance on different package options or provide a link to frequently asked pricing questions and answers. There are countless ways that you can harness the potential of automation without losing that human touch. By putting a few of these methods into action, you’ll be able to eliminate the redundancy of common support tickets and maintain a personal feel with behavior-based automation. Ultimately, freeing up time for your customer success teams to be more personal than ever before. It’s not about losing humanity; it’s about making more time for it. Ready to put the above scenarios into action? 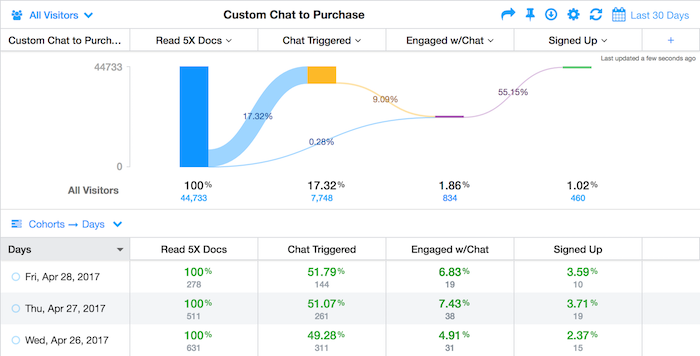 Woopra and LiveChat have partnered to make it easy for companies to personalize and automate messaging based on behavior. Check out the Woopra and LiveChat integration to learn more! 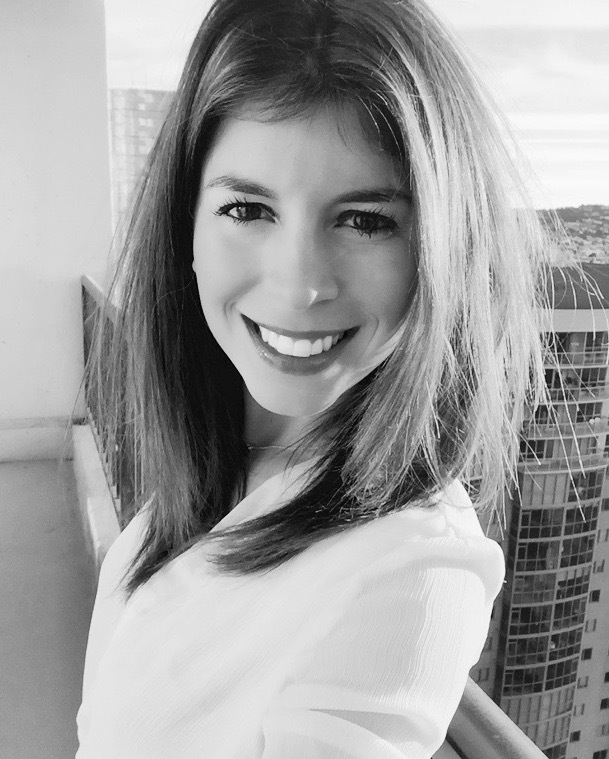 Elle Morgan is the Marketer and Evangelist at Woopra. , the leader in real-time customer intelligence. Her core mission is to help businesses cultivate data-driven cultures by transforming real-time insights into actions.